There’s no better way to soak up the sun and scenery than to hop on a raft and float down the shimmering Red Deer River. The beautiful Red Deer River runs right through Sundre. It is this river that provides the most fun rafting and kayaking adventures in Western Canada. Mukwah Rafting Tours operates in the area West of Sundre. 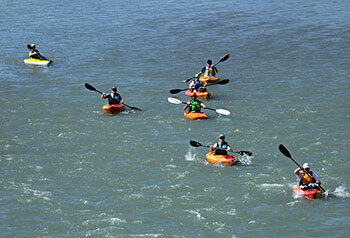 The Red Deer River is in fact touted as the most fun rafting river in Western Canada - guaranteeing you a good time! Mukwah Rafting sells rapidly, so call to book early! Hunter Valley Adventures is excited to offer an Outdoor Family Adventure that can include whitewater rafting, canoeing, fishing, horseback riding or hiking and ​classic camp games. Located west of Sundre near the Panther river. For those adventurers that prefer to be more in control of their vessel, the Red Deer River will challenge you and delight you. Several areas in the Sundre area are great to launch from, including Greenwood Campground. Stop in by the Sundre Visitor Information Centre for more information on potential launch locations. Unless you already have your own secret point, then please, launch away. Those who are unsure or inexperienced are welcome to try their skills on nearby lakes.